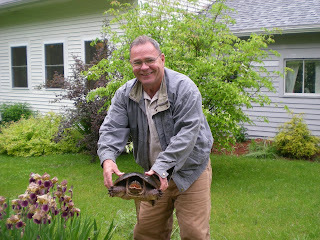 If you remember last May we found the turtle that Jim had come to his home for the past 4 years. We waited all summer for the babies to hatch. We had just about given up hope when our neighbor found one and told us about them. For the rest of the day we looked for babies. We ended up finding 5 alive and helped them across the road to the stream. We found three smashed in the road. It will be fun to see if she come back this next year and we have more babies. Oh they are so cute and tiny!! It's sad that some got squished but fun that you got to help. wow, I have never seen a baby turtle before! So cute! Thanks for rescuing them. Decorating and getting the tree for this year.